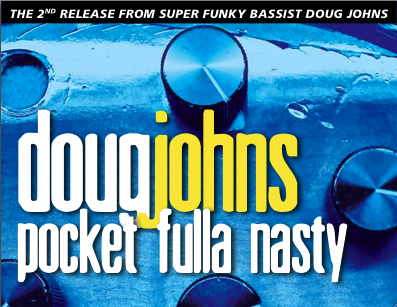 Bassist Doug Johns drops a battery of funk bombs all over his aptly named Pocket Fulla Nasty… Johns coolly slips and slides through a decidedly urban landscape… bumptious… groove-oriented… spanking horn section. Dangerous fun. Johns is an imaginative electric bassist with a seemingly unlimited arsenal of fresh licks and nuanced grooves…. Pocket Fulla Nasty couldn’t apply more than to what Johns & Co. achieve. Doug Johns continues to make a case for himself as one of the most credit–deserving bass virtuosos in America… it´s his inventiveness that´s consistently compelling. Doug´s playing is very deep and chocked FULL of groove and pocket… nothing but great bass work and a stellar band! A very heavy lesson in groove-ology is in store with this one… Highly recommended. Armed with experience, chops and soulful musicality, Johns advances the boundaries of electric bass with his unique brand of solid funk. Johns’ immense skill and originality make him a bass player worth hearing out….. highly recommended for anyone in the market for innovation forged with soul. The album is awesome, and just solid funk-groove based fusion, with some twists and turns… Straight up funk, down and dirty… funky fusion with a rock ice cube inserted… reminds me of the Yellowjackets with tattoos!… GET IT! Johns returns to glory with a new slate of funk on Pocket Fulla Nasty – an 11-track tour de force… this guy´s an absolute monster at his craft. He speaks softly, but carries a big four-string. He’s got a feeling for all the subgenres of funk and he’s played with a diverse roster of rockers and funkers all of which probably played a role in the trip around the funk world this disc provides. He’s right in the pocket of the jazz/rock greats. Doug Johns’ Pocket Fulla Nasty is an apropos title for this music disc. You can practically feel the nasty coming off the strings of this virtuoso bass player. It’s nasty in a good way though, with lots of groove and funk, not nasty in a bad way like a lipstick-smeared Courtney Love after a three-day chemical binge.